The Division of Campus Safety and Emergency Services and the Division of Enrollment and the Student Experience are continuing to pilot a new initiative to make storing relevant campus safety and support information on student cell phones easier with downloadable contact cards. Two contact cards are available: one with safety and emergency numbers and the other with support services, including the Counseling Center, the Sexual and Relationship Violence Response Team, Title IX and Student Assistance. Phone numbers, email addresses, websites and detailed descriptions about these services are all present in the contact card. Students can text “SUSafe” to 444-999 to get both contact cards added to their phones. 1. Text “SUSafe” to 444-999. You’ll receive a text with a download link shortly after. 2. Click the download link in your texting application. 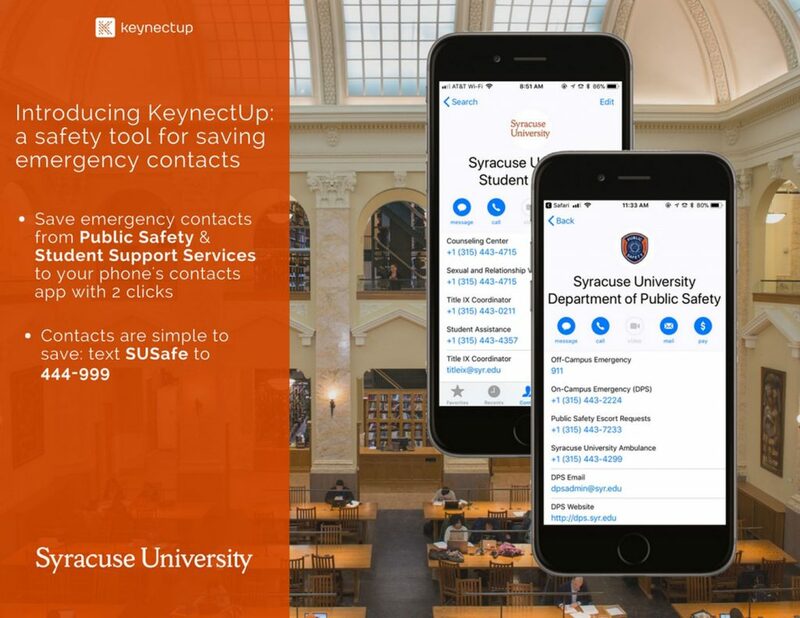 You will now be brought to a webpage of KeynectUp, the University’s service provider, with a link to the contact card. 3. Click “download card” or “open in contacts” on the KeynectUp webpage. The contact card will now be brought to your contact book. 4. Click “save” or “open in contacts” on the webpage. That’s it. If students have any problems with downloading the card, they can reach out to KeynectUp directly via text or phone call at 603.531.3211 or by email at support@keynectup.com. During this introductory period only, KeynectUp will draw the phone number of one user, and that individual will receive a $100 Visa gift card. You must complete the download in order to be entered for the drawing.